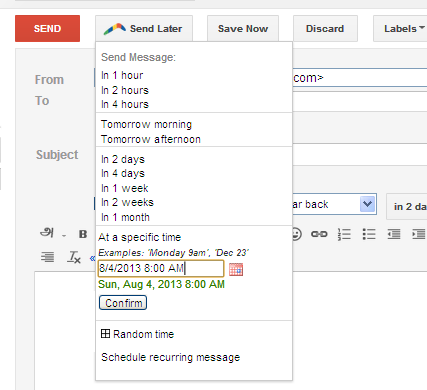 Defaultly Gmail does not have schedule emails feature which is enable to send emails at specific time automatically. You may bring schedule feature in Gmail by install some third party apps to your browser. There are lot of apps available to enable email schedule feature. But here I noticed 3 best Gmail apps to Schedule your emails. It is very popular and most used extension to schedule your emails in Gmail. Boomerang apps available for Chrome (5.0+), Firefox (3.6+) and Safari (5.1+) users. Boomerang supports 57 international languages. After you finished typing a messages then hit Send Later button set your date and time finally hit Confirm button. Scheduled emails will send automatically to specified address at right time. Right inbox is a another great tool to schedule your emails in Gmail. It is also available for Chrome, Firefox and Safari users. And Right Inbox having another great feature that is emails tracking. Right Inbox notified instantly when your email is read. So stop worrying about whether your email is sent successfully and also your can know know recipients location too. Right inbox available free and paid versions. In free versions you can schedule 10 emails per month.